Thrawn #2 is a sufficient adaptation, but I’m not sure how much more it really has to offer for fans who have already read the book. While there are images of the characters, ships and events, it’s nothing all that impressive. And for the story, it sticks closely to the book. There’s not much extra. Kicking off with the artwork, Luke Ross and Nolan Woodard have settled on an odd style for this adaptation. For instance, there is extensive use of dots to add texture to the backgrounds and characters. In turn, this makes some of the panels look like old 70’s Marvel comics with their use of colored dots. In fact the coloring and lighting has a very 80’s vibe to it. They style of the artwork makes the comic feel old and vintage. On the other hand, some panels are a bit scarce on details, that rushed-minimalist approach to quickly convey the sense of what is suppose to be there but without consuming too much time. That technique makes some of the comic feel like a really well done newspaper strip. The problem is all of this comes together for a less than stellar visual experience. You get the feeling that Marvel doesn’t have much of a bullpen of artists to choose from if this is what they have for a top selling Star Wars comic. Thrawn #1 was in the top 20 last month after all (#13 to be precise). As for the writing, there’s nothing to complain about. Jody Houser has done a good job of adapting the book to a comic. It’s just that it’s a straight adaptation. There’s nothing extra. I’ll be honest, I’m not sure why Marvel chose to do a Thrawn adaptation would they could have done an original Thrawn mini-series. An original story would have been far more interesting. It’s not like Timothy Zahn is cranking out Thrawn books, thus eating up the possible timeline they could play in. And it’s not like Star Wars Rebels is still a factor to contend with since the show is over. There’s plenty of time gaps they could have played in. Alas, Marvel opted for another adaptation, something they haven’t been able to do very well yet. 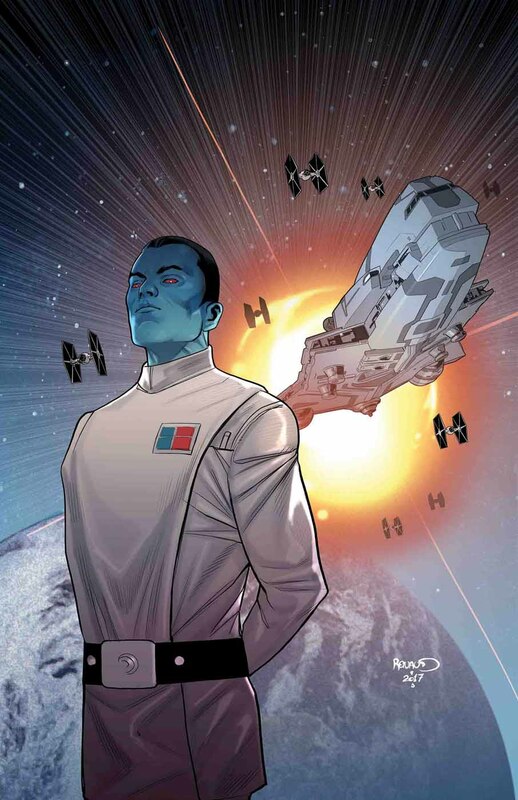 With Thrawn #2, you’re not getting anything unexpected. Depending on how big a Thrawn fan you are, or whether you read the book or not, this comic may or may not be something worth checking out. If you have no interest or time for the book, then the comic is definitely a good way to go. However, if you are a big Thrawn fan, and you’ve already read the book, your best bet is to just way for the graphic novel. There’s really no reason what so ever to pick this series up one-by-one. As a good straight adaptation, I give Thrawn #2 a two and a half out of five metal bikinis. It’s okay, but nothing special.